Challenge #437 - At the Beach! 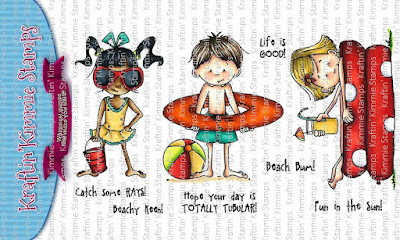 This week the theme is: AT THE BEACH! Kraftin' Kimmie Stamp in order to win. We've also got a fun sketch for your inspiration for June! You don't have to use it but if you need a little extra kickstart in your mojo, feel free to use it any time! Be sure to hop on over to the Krafty Shop this weekend because we have the FRUGAL FRIDAY SPECIALS up with FOUR of our amazing stamp sets on 40% OFF! Plus our Inspirational Wednesday featured set, TWEETIE PIES, is on SALE as well! AND we've also rereleased a super sweet RETIRED stamp set, TOTALLY TUBULAR by artist Cheryl Grant! So if you missed it when it was released a few years ago, you can snap it up NOW! Can't wait to see your krafty kreations!! Happy stampin'! I paper pieced the towel and drew in the flowers on her bikini. I used Tumbled Glass distress ink for the clouds and cork for the sand and palm tree. I inked the palms with Lovely Lagoon Krafty Kolours ink.